The average house may contain as many as 400 chemicals and most of them are toxic. 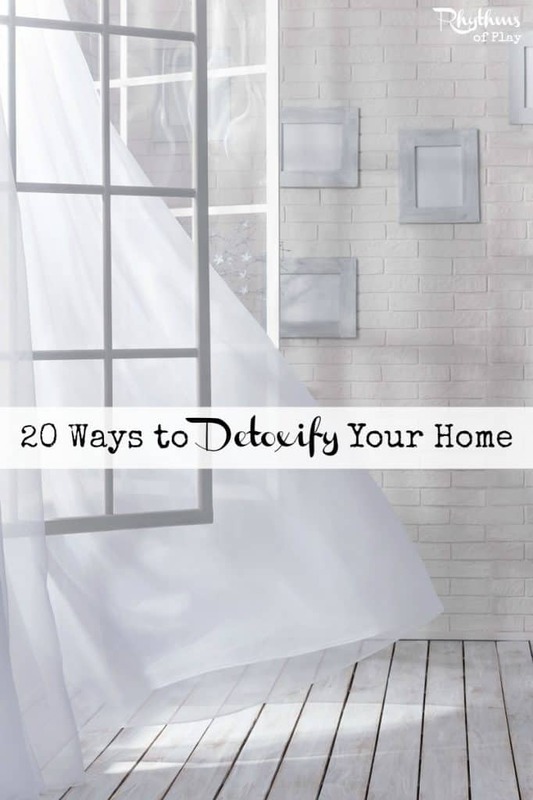 There are many ways to detoxify your home. Below are 20 tips to get you off to a good start. Our family has spent several years slowly clearing away the toxins in our home. You don’t have to tackle this in a day, or even do everything listed here. These are tips not musts. We just do what we can and know that it is enough. Some of these are simple ideas that you are probably well aware of and already doing. While others you may feel not want to do at all. Do what works for you and your family in whatever ways you can. Every little bit helps both your family and the environment. This post contains some affiliate and independent distributor links — opinions are my own. Thank you for your support! When you take off your shoes you eliminate a lot of toxins that get tracked into your house. This is a must for homes with little one’s crawling about. Dust is filled with toxins — Get rid of it as often as possible using natural ingredients. Make your own wood polish. The Lazy Mom’s Guide to Making Natural Wood Polish. Mold is a dangerous toxin — get rid of it or it will multiply and take over! I use natural products including vinegar and essential oils to clean my home — they get the job done and smell fantastic! Use mineral based natural cosmetics. Many natural foods stores carry a great selection. Use lotions and creams with ingredients you can pronounce or make your own! Useparaben & sulfate free shampoo’s, soaps and replace them with products made from natural ingredients. Use natural deodorants without Aluminum. Use natural remedies in your home. We use BestYet CedarCide for insect and pest control. It is a natural contact killer for bed bugs, fleas, ticks, lice, mites, ants, roaches, carpet beetles, silverfish, flies, mosquitos, chiggers, earwigs, gnats and an array of other non-beneficial insects. It kills insects on contact using cedar to attack their breathing system. It is deadly to pests and harmless to humans and pets. You can even spray it on skin as a natural mosquito and flea repellant! We also use essential oils to eradicate pests and care for our many pets. Young Living Essential Oil starter kit — comes complete with diffuser, pet remedy cheat sheet, and reference guide for your home! Open windows or keep as many cracked as possible. Get an air purifier or diffuser. I like to use my essential oil diffuser with Purification or Thieves in it for this purpose. Plastics contain toxins such as BPA’s that leech into the air and into anything that touches them. It’s best to keep them out of the house. Plastic shower curtains can be especially harmful. Purchase quality wooden toys as opposed to plastic ones. 20 Great Eco-Friendly Toys for Toddlers. Avoid plastic food packaging (when you can). Choose baby bottles made from glass or BPA-free plastic. Avoid vinyl teethers for your baby. Don’t purchase bottled water. Plastic water bottles are bad for your home and the environment. More than 700 chemicals have been identified in tap water. Drinking bottled water in plastic bottles is not a good alternative for our environment. See #9 above. Use a Berkey Filter add fluoride filters if your city fluoridates your tap water. Fluoride is EXTREMELY toxic to the body. Order Mountain spring water in 5 gallon glass jugs from a local water delivery service you trust. I know this one is not going to go over too well on many of you. My husband was reluctant to get rid of his when we met but now he is one of the biggest advocates of trashing microwaves that I know. Microwaves make your food totally toxic. They jiggle the atoms in food to heat it and this strips all nutrients while leaving only toxic waste behind. I had an argument with a physicist about this once. He apologized and got rid of his microwave after he researched the matter. You can too. You will be better off without it — trust me. I grew up without one. My mother has never owned one in her entire life! Wireless technology is bad for our bodies in so many ways — We are literally microwaved by it. Wire in as opposed to going wireless in your home if possible. This can be inconvenient at times but we think it’s worth it. EMF’s and other microwaves are especially harmful to the developing brains of our children. We use Earth Calm in our home to protect us. It gets the highest reviews of any other device on the market by those that are sensitive to EMF’s. Earthcalm Scalar Home Protection System for Home Protection & Smart Meters . Smart Meters let off extremely damaging EMF’s. Opt Out of Smart Meter Program. Opting out can be done with a few quick clicks online. A technician will come and replace it with an old school meter that works just as well without all the extra EMF’s you and your family don’t need. Teflon is toxic no matter what advertisers tell you. It contains PFC’s that have been linked to cancer and other developmental problems. There are lots of quality pots and pans out there without non-stick surfaces. I’m a big fan of cast iron and stainless steel cookware. Use natural fiber wool & cotton rugs and clothing. If possible, replace your wall-to-wall carpeting with hardwood floors, all natural linoleum or ceramic tiles. Use nontoxic glues, adhesives, stains or sealers for installation. What are the Dangers of Scotchguard? Particle board often contains formaldehyde, which can emit irritating and unhealthy fumes for decades. Avoid plywood, fiberglass, fiberboard and paneling if at all possible. Avoiding chemical fertilizers, pesticides, herbicides, fungicides, etc. is an important way to keep your family safe and detoxify your home. There is nothing better for your family, home, and planet earth than growing your own organic food. If you can’t grow it yourself purchasing from farmer’s markets and local natural food stores before supermarket chains is best. I often post about organic gardening and will be adding lots more soon. Check under the Gardening tab above and sign up for my newsletter so you don’t miss anything. HEPA-filter vacuums capture the widest range of particles and get rid of allergens. 20. Keep Your Home Happy! Avoid the dangers of emotional toxicity by keeping your home happy and drama free as much as possible. Diffuse Joy, Stress Away, Lavender, and Peace & Calming essential oils as needed! For more eco-friendly tips follow my “Green Living” Pinterest board! Follow Nell @ Rhythms of Play’s board Green Living on Pinterest. We do a lot of these! We also bought toxin-eating house plants that help clear the air. I’ve been feeling a lot healthier since. Adding houseplants is listed in #7 above with a link to a great post of 10 amazing houseplants that help improve air quality in your home. So glad it’s working for you! We went through a huge detox phase when my little boy had some immune system problems. We had been doing none of the above and slowly started implementing them. It was completely overwhelming and once I started looking into toxicity and immune health I had a few panic attacks! So anyone reading this and feeling like they’re swimming upstream: you can do this! Take it one step at a time and remember that any small change you’re making is going to make a difference long term. And btw Nell, we had the microwave argument too but really haven’t looked back since throwing it out! Oh Ann, I feel your pain. So many of these things I was unwilling to do at first. I wanted to stick my head in the sand and remain in ignorant bliss. But the health of our family’s and the health of our planet are depending on us to make small changes. One baby step at a time. Small change = BIG CHANGE. Just do what you can do and know that it is enough. I am so glad that you too have thrown out the microwave! Great list!! We’ve done most of these (hubs refuses to go without wifi :p) but my favorite has definitely been adding plants! I would suggest reading up on RO water though. Drinking RO water can actually leech minerals from your body! I used to drink only RO and when I read that, I switched the spring water and the difference was amazing! Now we have a Berkey to filter our tap water and a chlorine filter for the showerhead. Yes, thank you so much for the reminder Kim! I too have found out that RO water is not the best for the mineral leeching problems. This is an old post, and I just forgot to update that bit. I will be doing that ASAP! We Have used a Berkey filter for many, many years… But we currently live on a well where the water can not be drank even when filtered. There are some chemicals in it that are harmful that don’t filter out. Big bummer! We have to order Mountain spring water from Shasta in 5 gallon glass bottles now. When we lived in LA we had to put a fluoride filter in our Berkey. Find out if your city adds fluoride and get that attachment if they do! I found your blog while searching for ways to detox our home and I think it’s really cool. However, I found that some of the sources in the ‘beware of EMFs’ part that you linked to didn’t have a lot of information, research or tips about how to avoid EMF exposure. Also, the articles are not written as clearly as they could be.